When the Vive and the Oculus Rift came out in the spring of 2016, they did something incredible: they made VR actually worth caring about. Previously, the closest thing people had come to virtual reality were weird sci-fi movies or half-baked products like the Virtual Boy. Yet even now, nearly two years later to the day since the original Vive arrived, VR headsets still aren’t a household commodity. While that might be a bit depressing for some of us, it’s not really that surprising, because the release of those original head-mounted displays was only just the beginning of a much bigger three-step cycle. A cycle, that’s now moving into its second era today, with the debut of the new Vive Pro. Sporting a higher-res display, a redesigned headset and some thoughtful creature comforts, the Vive Pro is better is almost every single way. Unfortunately, for a device that was already hard to justify buying, Vive’s second-gen headset is even more expensive now too. But let’s skip over that for a minute and instead talk about what this sequel really offers. The first thing you notice is the Vive Pro’s new cool blue plastic housing, which features two front-mounted stereoscopic cameras. But don’t get too excited by those, because developers haven’t actually made anything that takes advantage of them yet. The real treat is actually around back, and comes in the form of a little dial that can be used to adjust the headset’s fit. Clockwise to tighten, counterclockwise to loosen. It’s a small change, but it has a big effect, because on the OG Vive, every time you needed to make an adjustment, you basically had to take the whole rig off. The new cowl around your face makes the Vive Pro so much nice to wear. Then, on the inside, Vive has equipped the Pro with new foam around the facemask, and that’s not only more comfortable and better balanced, it also breathes better too. Even after multiple hour-long VR sessions, I didn’t have a single issue with fog or moisture ruining my experience, which is an issue that often plagued both the Oculus Rift and the first-gen Vive. The Pro’s optics have also been improved, so you can adjust for inter-pupillary distance (aka the space between your eyeballs) like you could on the old model, while also customizing how far the headset’s lenses are away from your face. That’s an extra dimension of overall adjustability and it also serves as a pseudo field of view slider in case people don’t want images smashed up against their retinas. Getting the Vive Pro to fit is as easy as turning this dial in back. On the sides, there are new built-in headphones, that solve a whole host of issues. The first of which is that it streamlines the setup process, because now there’s only one cord coming out of the Vive Pro’s included breakout box (the thing that actually connects the headset to your computer). The second enhancement is one of usability. Since their release, one of the big advantages of the Rift was that you didn’t need to fumble around for headphones after putting the headset on your face, they are already attached. However, now Vive Pro can do that too. Just flick down on the ear cups and off you go. The new headphones kind of just dangle down. The last and potentially most important benefit the built-in headphones provide is a standard platform for conveying spatial sound to the user. On the original Vive, it was mostly on you to provide your own headphones solution that could be plugged into a 3.5mm adapter. The problem is that you average set of cans aren’t really built to make 3D audio sound right. This often meant that if there was something that was supposed sneak up on you from behind, it didn’t always really sound that way, which could cause your suspension of disbelief to be shattered while in VR. Now, devs can design based around a standard hardware platform, to make sure the noises that go into VR apps are the same ones you will experience. The problem is that unlike normal headphones, they don’t offer the most secure fit. The one challenge to all this is that the Vive Pro’s built-in headphones are closer to on-ear cans that just sit on your ears than closed-back over-the-ear headphones that surround them. That means unless your VR room is perfectly quiet, ambient noise is going to leak in from outside, which isn’t ideal. And because the Vive’s Pro’s headphones just kind of dangle next to your ears instead of getting pressed into your head, there’s not much you can do to improve them. Thankfully, if you are so inclined, the Vive Pro has a hidden USB-C port, which can be used with a headphone adapter, so that you can still use your own headphones if you want. OK, enough about the outside, what are the Vive Pro’s new optics like to actually use? At first, I was actually a bit underwhelmed. Despite increasing the Vive Pro’s resolution by 78 percent to 2880 x 1600 (or 1440 x 1600 to each eye), the jump in sharpness isn’t as big as the difference between standard def and an HD TV. Pixels are smaller, but they are still visible to the naked eye, and you can also see some jaggy, aliased lines on many diagonal polygons so things don’t always look perfectly smooth—like sitting to close to a TV. But even so, the overall impact is big, because while subtle, the improved fidelity combined with the better audio makes it easier than ever before to ignore meatspace and focus on what’s playing out virtually in front of your eyes. Along with the main cable to goes into the Vive Pro from the breakout box, there’s also one USB-C port that’s usually hidden behind the headset’s cowl. Currently, there’s no tag to differentiate between games made for the OG Vive or the new Pro, but there will be soon. Not that it matters because even the most stark, minimalist games like Superhot look better in Vive’s new headset, while 360 videos viewed in the Vive Video app seem more lifelike too. But the experience that really showed me how far the Vive Pro had come was when I used the Bigscreen app to recreate the view from my physical desktop monitors in VR. Text looks so much better, and soon, I found myself writing chunks of this review while still wearing the headset. Even when compared to Samsung’s Odyssey HMD, which has the same resolution, the Vive Pro is better thanks to its more precise motion tracking, 3D spatial audio, and wide SteamVR and Viveport VR app support. The power of the Vive Pro is that it turns the thought of working in VR from a silly idea into one that’s actually quite exciting. And once I saw better looking text on regular websites in VR, I started appreciating those details even more in full-on VR apps. It’s the ability to recreate finer details that’s is going to define this second era of VR development. The big strokes were there, the Vive Pro is adding the polish. I’m not a huge fan of proprietary connectors, but having one cord going out to the headset does make things less complicated. But now, back to the question of price. On one hand, the Vive Pro is so good that I wouldn’t want anyone to try out the first-gen headsets now that this exists. In a vacuum, it just doesn’t make sense to go back. 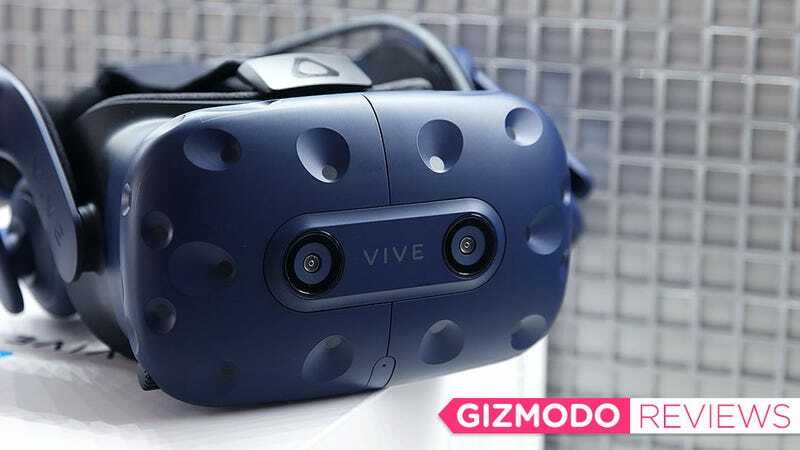 But as something that you can actually buy, compared to the $500 kit that includes a standard Vive, two controllers and two base stations, the $800 Vive Pro is a real hard sell. And that’s before you consider that the full price for first-time VR explorers is actually $1,100, because the Vive Pro doesn’t come with any of the system’s essential peripherals, like base stations or controllers. There’s also one last thing that’s really bugging me. At CES 2018, I tried a Vive Pro paired with the upcoming Vive’s upcoming Wireless Adapter, and after experiencing the joy and freedom of not having a wire tying me down, there’s no going back. If Vive put both the new headset and the wireless adapter in the Pro’s box, $800 or even $1,000 would actually feel like a steal. Maybe I’m spoiled, but to me, this headset needs that extra bit of futuristic tech to really justify its price. But regardless of whether you buy it or not, the second phase of the grand VR experiment has arrived. Unfortunately, most folks may not hop on until phase three, when companies can figure out a way to put all this marvelous tech together and make it affordable. Ready Player One gets more real every day. 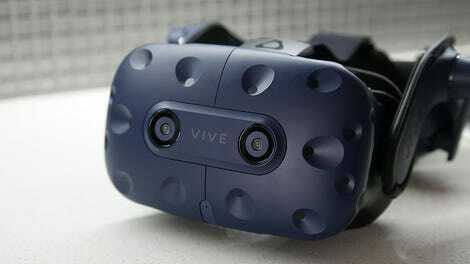 Sporting new built-in headphones, redesigned face cushions, and a new adjustment dial, the Vive Pro is way more comfortable to wear, despite weighing an extra six ounces than the standard Vive. The new 2880 x 1600 display pushes 78 percent more pixels than before, but it also means slightly higher PC requirements. A Nvidia GTX 1070 or AMD Vega 56 GPU are recommended. The $800 Vive Pro package only comes with the headset and the breakout box, so if you don’t have them already, you’re going to need to spend an extra $300 to get two base stations and two controllers. New built-in headphones don’t fit as snug or isolate noise as well as traditional over-the-ear cans, but the new 3D spatial sound support is an important step for VR. Still waiting for Vive to reveal more info on its upcoming wireless adapter.